We are committed to providing you with equipment in perfect condition. Our skis go to the workshop for a service (edge sharpening and re wax) after every rental. Boots and helmets are dried and disinfected after each rental. The purest ingredient, the quintessence! 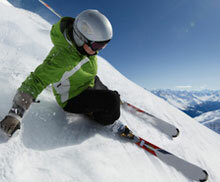 World cup skis, wide skis, even extra “fat” using the latest technology, equipment which is rarely found for rental. For snowboarders eager for large spaces, now it's your turn ! And don't forget the safety rules! 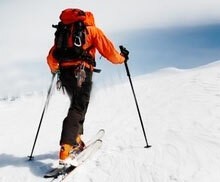 If you want to go further and discover other horizons, far away from the ski lifts, practicing the ski touring is the most complete mountain sport, combining the pleasure of both glide and efforts, far from the beaten paths. You have an excellent level, you lean in to the bends nearly touching the snow. Off piste, you are able to handle any grounds. The weight of the skis doesn’t bother you. What matters the most to you is that they are dynamic and give you the best sensations! You have a good “traditional technique» as you have been skiing several years. You handle downhill wide slalom well but as soon as it gets a bit steep, you start to slide a little and wish that you could progress!